I know everyone is done with their Dr. Seuss stuff for this year but we made these really cute hats on Friday that I just had to share. I got the idea from Khrys at Keepin it Kool in Kinderland. Click HERE to see her hats. They are ADORABLE! When I saw them I knew I had to make them since last year I made Cat in the Hat hats and lets just say they were a PROJECT!! I wanted them to be tall but then they wouldn't stand up, so we taped paint stir sticks to the back and then they were heavy and still fell over!!! It was a weeks worth of trying to make them work with no luck. Now I love her hats with the painted hand Things but after my 100's day hat painting debacle (I won't bore you with the details again but I ended up with paint ALL over my shirt) I had to find a way to make them without the painting! So here is what I came up with. I loved Khrys' idea of having them call each other by their thing names so I made the circles to put on their hats and my kiddo's LOVED them! They thought it was great to call each other their Thing numbers, I even wore the Thing 1 hat for the day! 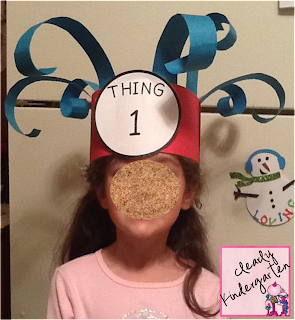 If you would like to grab a copy of the Thing Hat circles, I have them linked up as a FREEBIE HERE! I made them through 30, hopefully no one has more than 30 kiddo! On another note, I reached 100 followers this weekend!!!!! I never thought I would get to 100 followers when I started this blog in August! I am so grateful to everyone reads my ramblings and love all of the bloggy friends I have made! To celebrate I would love to have a giveaway....if anyone is interested in donating something I would be so thankful! Just leave me your email and I will contact you or you can email me at clearlykindergarten@gmail.com. 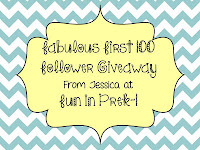 Oh and before I go my friend Jessica over at Fun in PreK-1 is having her 100 Follower giveaway and it is HUGE! You really want to go check it out and enter to win!! Trust me! Click the picture to take you to her blog to enter. I LOVE your hats!! Sooooo cute!!! Thanks for the shout out, that was very sweet :) I'm so happy for your accomplisment! WOO HOO! I'm not surprised though, you are so incredible! Of course I would be MORE than happy to help with your giveaway! It is going to be such a success girl! Thanks, you are the best! I will email you! Love your hats Sarah! Congrats on reaching 100, just let me know what you'd like and I would love to contribute! Thanks Jessica! I will email you! Super cute hats! I love the curls :) Congratulations on reaching 100 and I would be happy to contribute something. Love the hats, we are still working on Seuss through Friday. My theme is thing one oriented this year, and my K4 class is making thing shirts and hats for our big art show in May to wear, so I appreciate the numbers you made. I found you on the WI link, I teach in Wauwatosa. Thanks again. WOW That hat is the best Seuss thing I've seen so far! Love it! Wish I had seen it for this year, but will definitely be using it next year! Your hats turned out to be adorable! Thank you for sharing. 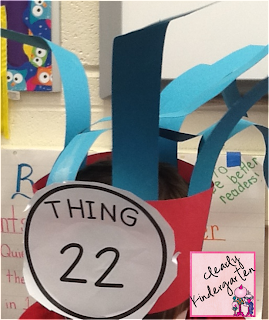 i will use this for my kindergarten class on our Dr. Seuss Day. Let me just say CUTEST HATS EVER!! Thanks for freebie-that rocks!!!!! Love your ideas! These hats are terrific! How did you make the curls stand up and not flop? The key to making the strips stand up and not flop is to make them short and wide. I usually cut mine about 1 1/2" wide and 12" long. Hope that helps!! Love your Thing hat! What materials did you use for the band and the hair?